Fresh, tasty and you can cook it with your eyes closed! Ohhhh yum!!!! 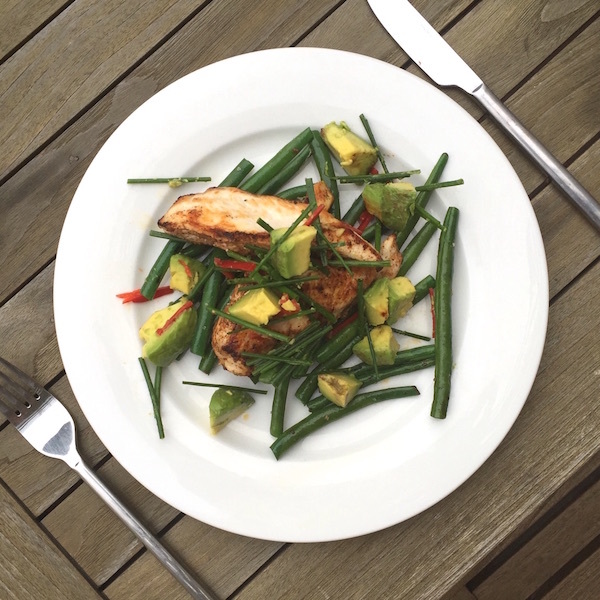 This Jerk Chicken and Green Bean Salad is packed with protein and comes with a bang of freshness and chilli! For those wanting to stay lean or lose weight, this is your perfect meal - low calorie and super-tasty! Free range chicken cut to a medium size. Good handful of green beans, ends trimmed. Long red chillies, deseeded and sliced lengthways. Place chicken into container or onto a plate and season with jerk seasoning, paprika and cayenne pepper. Set aside. Combine avocado, chillies, chives and lime juice in a bowl and gently toss. Spray heated skillet and grill chicken on medium heat until browned. In a seperate skillet, quickly toss green beans and season with a sprinkle of salt. Serve on a plate. Top beans with chicken and then salsa mix to serve.